I recently planned a full day with my girls to go to Lake Farmpark , located in historic Kirtland, OH. Let me tell you, we had a ball! I knew it was going to be THE place for me once I saw the rusty-wheel wind chime hanging just outside the entrance of their Plant Science Center. Dangling from this rusted beauty were miniature clay pots creatively painted in all sorts of ways including paisley print, floral patterns and even camo. 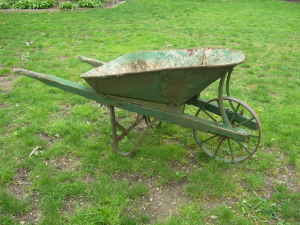 Can you believe, I logged onto Craigslist today only to find an old rusty wheelbarrow who's wheel would be perfect for this project! Hubs would KILL me if I brought home another BIGGIE-SIZED piece of junk right now though, so I'll just have to file this project away for a later date. Looking at the bright side, maybe it has inspired you to make one for yourself! as well as the juiciest. We saw the sweetest lamb..that didn't eat much. and a big ol' moo cow that was apparently framed and incarcerated in a local bovine jail. ...and the sleepiest, laziest, and most peaceful looking hog in all of Lake County. Have you ever taken more photos of inspirational junk projects than that of your own family and friends you were with? (Sorry kiddos.) ;) Let me hear all about it! A few weeks ago I visited one of my favorite blogs and came across a stack of cast aluminum letters on Sylvia's Vintage Daughter. Kathy, the owner, has become such a great Ohio junk friend and I knew she and her friend, Terri (her "partner in junk") had started a new venture in a local antique mall in Bellville, Ohio, for which they were selling those amazing letters. So I shot off an email and asked if she'd be willing to ship if I bought the "A". And she did...she also added that she included some "extras" in my shipment too. Hmmmm. ...in the cutest "junky" bag. Isn't it darling? Love it!! Over the years I've come to realize junkers are some of the kindest people you'll came across in your lifetime. Kathy just reaffirms my thoughts on that and I am bound and determined to meet her one day! This post is also featured on the Junkmarket Style website. Pssst, here's a test for junkers worldwide. What do you do with a baby crib spring found on the curbside? Shhhh, I'll give you the answer but you must keep quiet. A crib spring and burlap makes for a beautiful wall weave display. I recently switched to a very neutral pallette with a more casual feel in my dining room. (Uh...like yesterday). This project helped achieve that look. Notice I included Junkmarket member Bec4's ingenious wine rack idea here. It was made using a drawer from a vintage sewing table. As soon as I saw her post I knew I wanted to have my own! If you haven't seen the original...check it out. Be sure to stop by Bec4's creative blog to see all her great ideas. Cost of seed pots - $.12/ea. Cost of thrifted glass - $1. Cost of plant from local metropark plant science center - $3. Finished junk vignette - priceless. See the crib spring among the junk goodness below?? Determine the size needed for your burlap strips. Make a small snip where you will cut. Instead of cutting right away, pull one thread out of the burlap where you snipped. Now you have a perfectly straight line to use for cutting your burlap. I highly recommend you cut all burlap strips before starting to weave. Weaving complete! Another HIGHLY RECOMMENDed step - Have another set of eyes handy to look over your work WHILE you are weaving. My 9-year-old second set of eyes informed me multiple times I messed up the weave design. Thanks to Maddy I didn't complete the entire project before realizing my mistakes. Just to keep the design simple, I made photocopies of pictures from a botanical book and attached them to gray cardstock. Using cool clips finished it off. Next step, (an extra set of HANDS are nice) pull each fabric strip taut around frame and clip using a safety pin. There are many ways to repurpose old bed springs. Check out Lani over at Cottage Elements. Her crib spring post was definitely my inspiration! Due to safety regulations and liability with used cribs, springs are readily available in trash piles all across the nation. Be sure to pick one up for your next project and let us know what you came up with. ...or so I hope. Last month I came across a beautiful Australian blog that I just can't seem to get enough of. Simply Natural is filled with gorgeous photos that inspire changes in your own home decor. 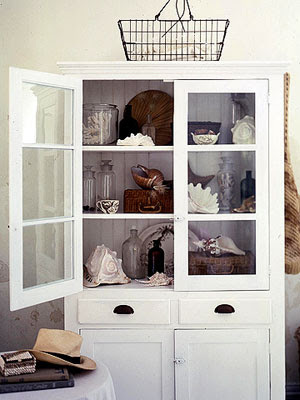 After viewing the author's post on her love of shells, I tried to accomplish "the look" she shared with pieces of my own personal seaside junk around the house. Mixed together with time-worn leather suitcases, vintage aluminum thermoses and a few old glass jars, the finished look was quite pleasing. I think I'll add a few more junk fillers to it at some point, but overall I'm fine with the way it looks now. Do you look to others to replicate a look? I knew at some point I'd have to do a Candy Land party for one of my girls for my own selfish reasons, however time was running out. So my baby Meg got the full-on candy treatment for her 4th birthday over the weekend. Meg's guests were greeted by a "candy bar" that included a multitude of candies including M&M's, gummie bears, marshallow twists and ice cream cones, and circus peanuts. A large lollipop tree held suckers to be pulled out. Depending on what color tip was at the end of your stick determined what non-candy prize you received. (FYI - Helium tanks are not that attractive as party decor). These candy fans chose a goodie bag to decorate with sweet stickers. This bag would be filled with treats throughout the party. A simple festive decoration is hanging curling ribbon and candy dots from a chandelier. These candy crusaders below entered "Gingerbread Forest" and received a gingerbread necklace made from clearance St. Patrick's Day leis and a clearance deck of gingerbread playing cards. They were then directed to the King Kandy and Princess Frostine crown area where each guest made a crown for themselves decorated with more candy stickers (found at JoAnn's for $1.00 per book...great price). Thanks to Hubs helping hand pre-party as well as during, he was able to get a shot of the family room while the party-goers were in other rooms. This was the Mr. Mint and Princess Frostine combo room. My oldest daughter was the D.J. and coordinated a great game of "freeze dance" in honor of Princess Frostine. Party like a 4-year-old rock star I say!! Meggie opened her wonderful gifts from all her friends and treated them to strawberries and fruit dip, bananas, cheese and crackers, popcorn and marshmallow filled ice cream cones and yummy confetti cupcakes! Just something sweet and simple.